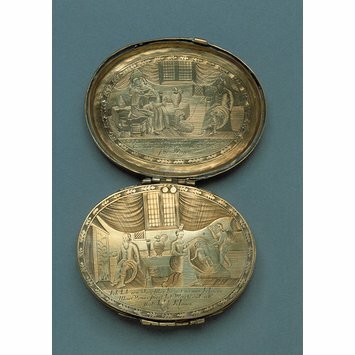 This tobacco box is superbly engraved with scenes intended to stimulate conversation. 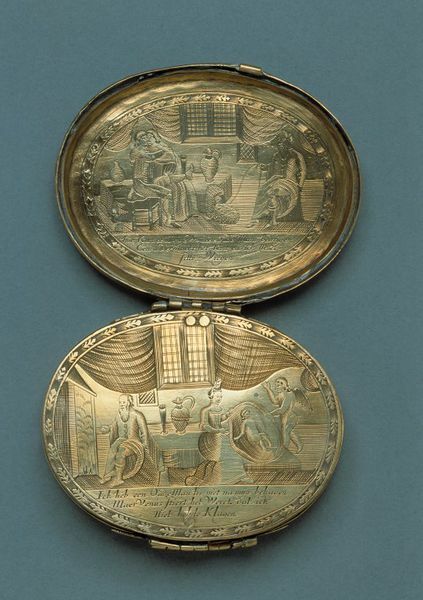 The compartments depict a woman committing adultery in view of her husband inscribed: 'How can a young woman bully an old man Another makes the baby and I like a mother rock the cradle? '; a loveless marriage inscribed: 'I have an old husband who gives me no pleasure, but Venus manages the business so that I have no reason to complain'; and a false bottom which shows a happy family with the inscription: 'One finds nothing so sweet in fidelity as love between a man and a wife'. Engraved on the lid: Aeneas Rescuing Anchises from burning Troy; on the inside of the lid , a scene of adultery, and an inscription which translates, How can a young woman bully an old man? Another makes the baby, and I like a mother must rock the cradle. The box has a secret lid engraved with a domestic scene and: I have an old husband who gives me no pleasure, but Venus manages the business so that I have no reason to complain, on one side; on the other a woman hitting a man with her chatelaine, and the inscription, O miserable marriage, would that you had never taken place. The base has a false bottom, and the two scenes show a happy family, with the inscription, one finds nothing so sweet in fidelity as love between man and wife, and a warrior pursuing a woman with children, with the inscription, where man despises true love there is a land that stands in evil. The underside is engraved with Alexander visiting Diogenes. Brass tobacco box, The Netherlands, early 18th century. This tobacco box contains several compartments all exquisitely engraved with scenes illustrating the virtues of a sober family life. Inside the lid a woman is depicted committing adultery in full view of her husband. An inscription in Dutch translates as, "How can a young woman bully an old man? Another makes the baby and I like a mother rock the cradle". The two exterior faces show scenes from classical mythology: Aeneas escaping burning Troy with his father Anchises, and Alexander visiting Diogenes.